When it comes to breakfast, Southern food has my heart. There’s a place in Athens, Georgia that I think about every time I try a new breakfast place. Mama’s Boy is packed every weekend morning with college-aged patrons looking for homemade biscuits, cheese grits, fried chicken breakfast sandwiches, raspberry jam in a squirt bottle and sweet tea. It’s Southern food and atmosphere at its absolute finest, and is hands down favorite breakfast spot of all time. After my experience at Olivia last week, Mama’s Boy has some competition. Olivia floored me. I have heard only rave reviews of the South Lamar restaurant since moving here, but the steeper prices and long wait times kept me away until now. 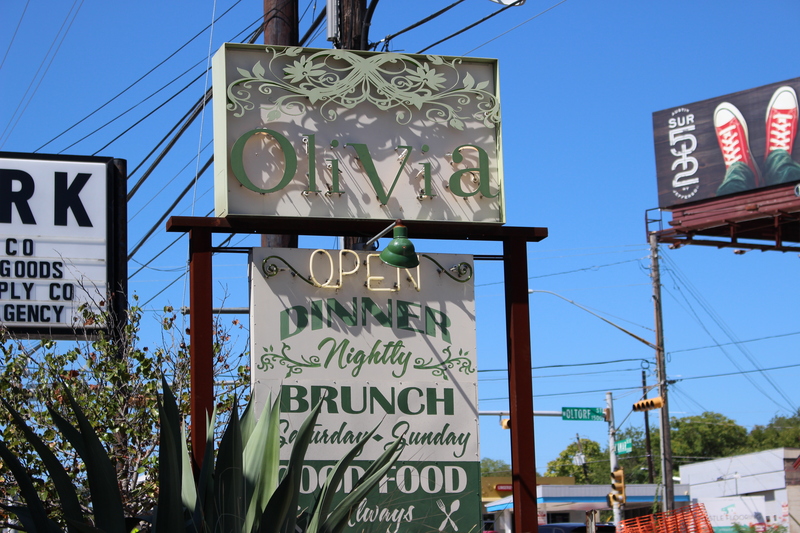 Like every brunch place in Austin, Olivia is more than prepared to liquor you up on a Sunday morning. But I’m not here to talk about booze. Each dish we enjoyed last weekend deserves more words than you’d care to read. Olivia offers dishes ranging from the simple to the incredibly detailed. It seems ridiculous to order an omelette when the options are so diverse, but someone once told me that a place is only as good as its basics. So let’s start there. 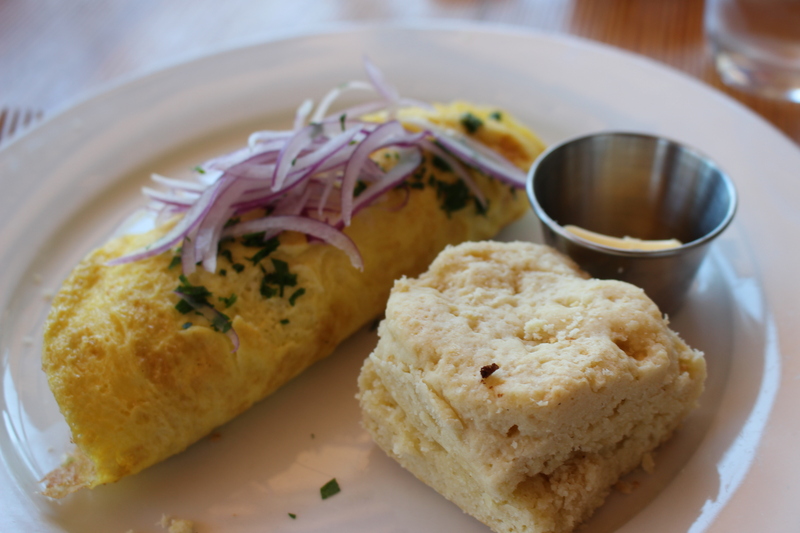 Best bang for your buck: Olivia’s spinach omelette, sub biscuit. Olivia’s spinach omelette ($12) is a splendidly generous portion of honey-black pepper goat cheese, fresh spinach, red onion and herbs, all wrapped in fluffy local eggs. Each bite is creamier than the last; there’s a sweetness in it that keeps you going back for more. And while the omelette is normally served with toast, I highly suggest replacing a slice of bread with one of Olivia’s biscuits. The biscuit is basically butter dressed up for church on Sunday. It is the perfect combination of buttery and cake-y; it is just dense enough to hold a dollop of housemade strawberry jam but delicate enough to melt in your mouth. I could eat seven of them. Olivia’s biscuit may not look like the ones that emerge from a cardboard tube and turn golden at 350 degrees, but it shouldn’t. It looks like someone made it with their hands just for you. 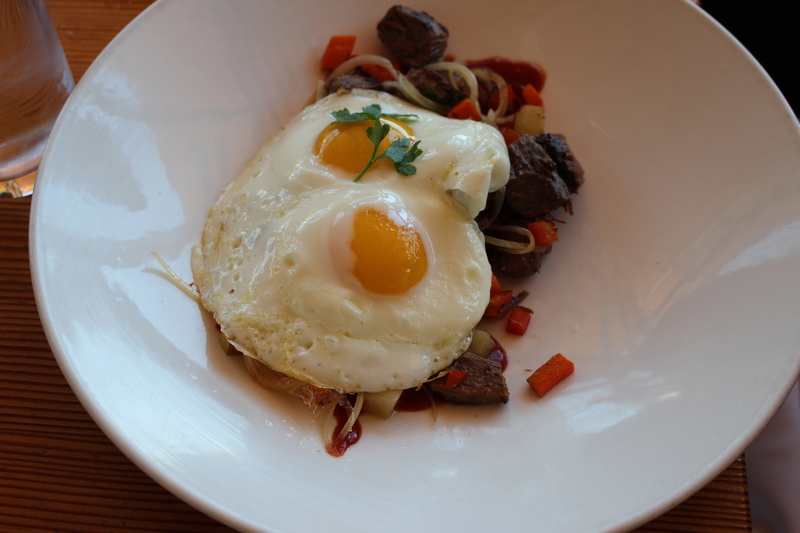 A step up in complexity from omelette is the Brisket Hash ($18…woof! ), a perfectly simple preparation of Texas brisket, potatoes, vegetables and barbecue sauce with fried eggs on top. It may not be the most gorgeous of Olivia’s platings, but the brisket is so incredibly flavorful that you don’t want to stop eating it for a second. It’s lighter as far as briskets go, and the serving is rather small, but the quality of the ingredients is apparent in the intense satisfaction that comes with a clean plate. If Olivia has a Masters in simple preparations, they have a PhD in the complex. Their Dan Quail is a perfect example of that skill. Ladies and gentlemen, Mr. Dan Quail. 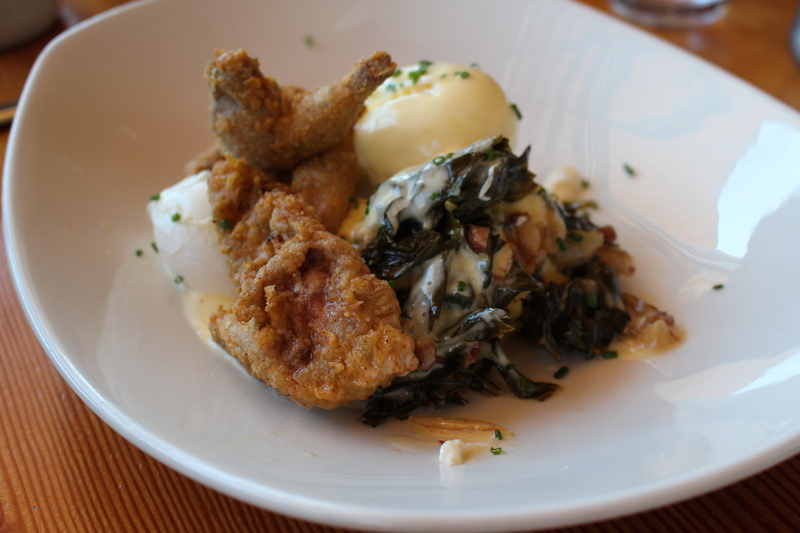 This dish takes a fluffy corn cake, tops it with collard greens, poached eggs and chicken fried quail and then covers the whole mess with pot likker maple hollandaise. Oh. My. God. It’s been a while since one bite of something has made me swoon as much as this dish. The use of quail is genius; the meat is so flavorful and tender when cooked correctly (and cooked correctly it was). Treating it liked fried chicken and keeping it company with traditional southern flavors of collards and maple and cornbread is equally brilliant. The $17 price tag is steep, but worth every penny. 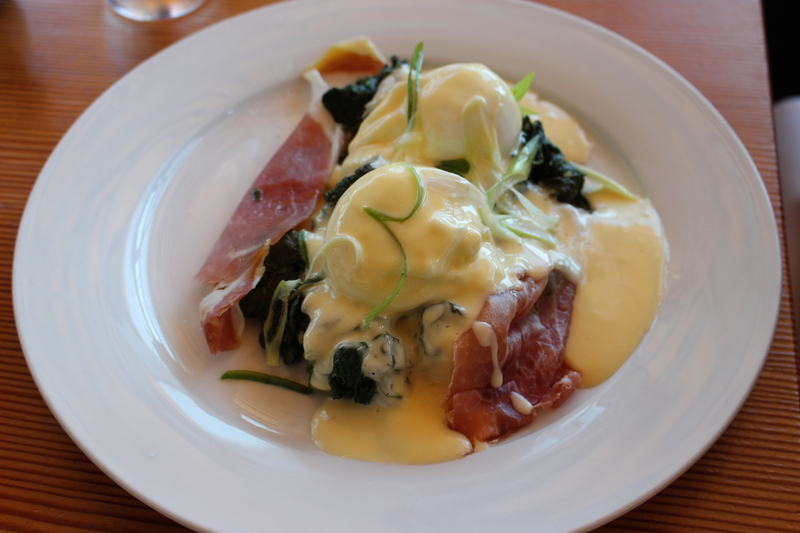 The dish is sophisticated without being pretentious and the portion is more than enough to satisfy the most ravenous of brunchers. When you need a little something extra: Olivia’s version of a cinnamon roll, topped with salted caramel and pecans. 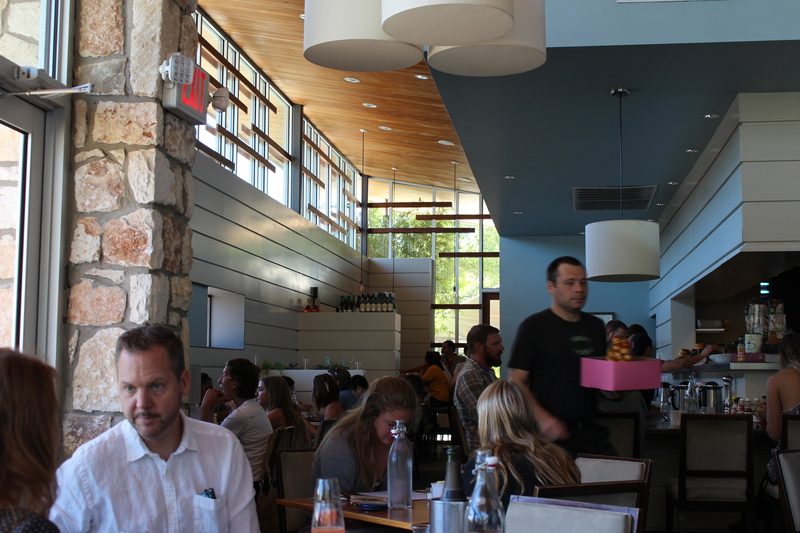 It’s no mystery why Austinites flock to the restaurant every Sunday. The food comes out quickly without making you feel rushed; the service is friendly, accommodating and patient. With floor to high-ceiling windows that let the light flood in, it almost feels, quite frankly, like church. I’m not religious, but food I do believe in, and there’s something to be said for a Sunday experience that reaffirms your faith.